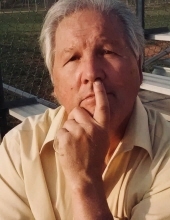 Eddie Darrell Harris, 71, of Perkins, OK, passed away Sunday, March 24, 2019 in Oklahoma City surrounded by his loving family. Funeral services have been entrusted to the care of Dighton-Marler Funeral Home of Stillwater. Visitation will be 9:00 AM to 8:00 PM Wednesday, March 27, 2019 at Dighton-Marler Funeral Home. Family will greet guests from 6PM to 8PM. A Celebration of Eddie’s life will be Thursday, March 28, 2019 at 1:00 PM in the Chapel at Dighton-Marler Funeral Home. Pastor Jonathon Horner will officiate. Pallbearers will be Sam Harris, Mark Solano, Landon Horner, Justice Solano, Caleb Russell, and C.J. Radford. Honorary pallbearers will be Logan Solano, Patrick Gatton, and Awnesty Radford. Eddie was born May 19, 1947 in Monahans, TX., to Darrell and Patricia Anna (Garner) Harris. He grew up in the Oklahoma City area and graduated Western Heights High School in 1965. On June 16, 1966 Eddie joined the United States Navy and was honorably discharged in 1968. After his time in the Navy, Eddie graduated Apostolic Bible Institute with his Associates in Theology; and was called into the ministry as an Evangelist and a Pastor. He committed 13 years as the faithful pastor of the Apostolic Church of Jesus Christ in Yukon, OK; where he had a life changing impact on everyone that had the opportunity to be around him. Additionally, Eddie Harris was an entrepreneur and inventor. He was a painter by trade but was known as someone that could get any job done fast and right earning his nickname “Fast Eddie.” He never started something that he did not finish. He invested over 25 years painting and building Stillwater as his home. The only thing that took precedence over his work, was his family and the many friends that he treated as family. He was proud to be a father, a grandfather, and a great grandfather. He would carry a camera around with him everywhere he would go just so that he would have the opportunity to capture memories with his family, his friends, and more than occasionally; absolute strangers. Finally, Eddie was a game player, a prankster, and his jokes were referred to as “Eddie Jokes.” He could play cards and dominoes with the best but be careful because he was not ashamed to use sleight of hand when playing. He believed that you had to make the best of your life and not take it too seriously because you did not know the time that you would have. Survivors include his wife Beth of the home; two daughters, Crystal Solano and husband Mark of Yukon, OK, and Charisma Horner and husband Jonathon of Perkins, OK; one son, Samuel Harris and wife Jamie of Joplin, MO; eight grandchildren Logan Solano and wife Kristen, Awnesty Radford and husband C.J., Caleb Russell, Landon Horner, Justice Solano, Brandi Solano, Gabriel Harris, and Everlyn Harris; six great-grandchildren, Faith, Arora, Blake, Zane, Zada, and Raven; three siblings, Marydith Harris of Yukon, OK, Johnny Harris and wife Karen of Norman, OK, and Teresa Ann Everest of Houston, TX; numerous nieces and nephews, and a host of friends. He was preceded in death by his parents; and step-mother, Betty Harris. To send flowers or a remembrance gift to the family of Eddie Darrell Harris, please visit our Tribute Store. "Email Address" would like to share the life celebration of Eddie Darrell Harris. Click on the "link" to go to share a favorite memory or leave a condolence message for the family.